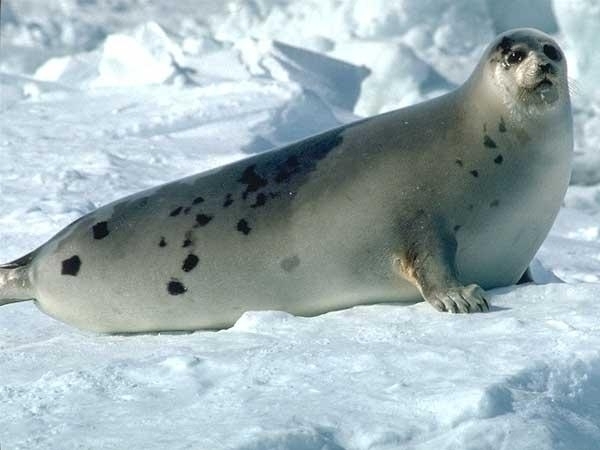 Harp Seals also known as the Saddleback Seal, get their common name from the harp-shaped pattern on the dorsal (upper) side and flanks of adult Harp Seals. 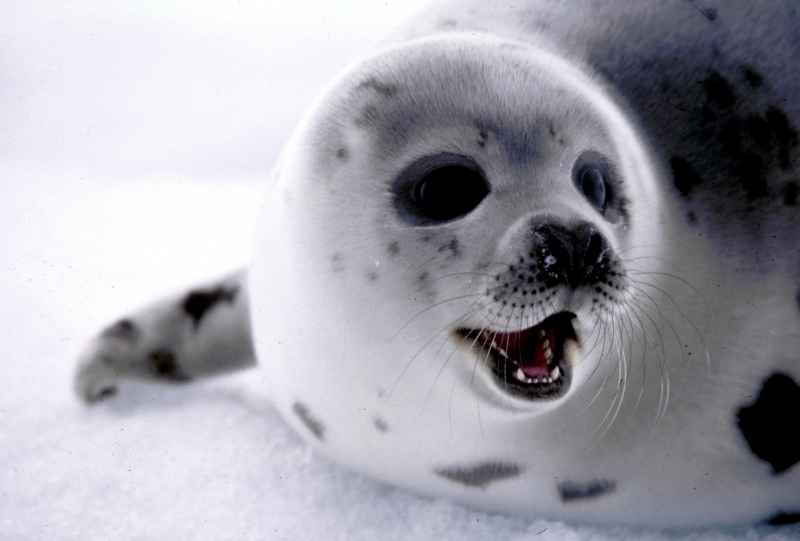 These patterns are more distinct on the bodies of adult males. 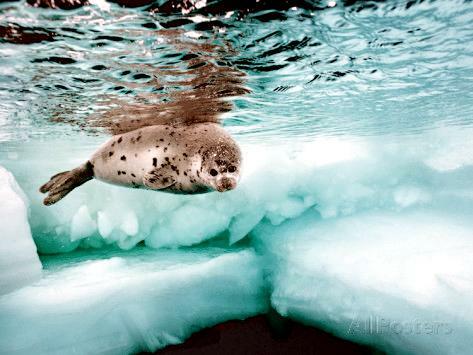 The Latin name translates to “ice-loving seal of Greenland”. 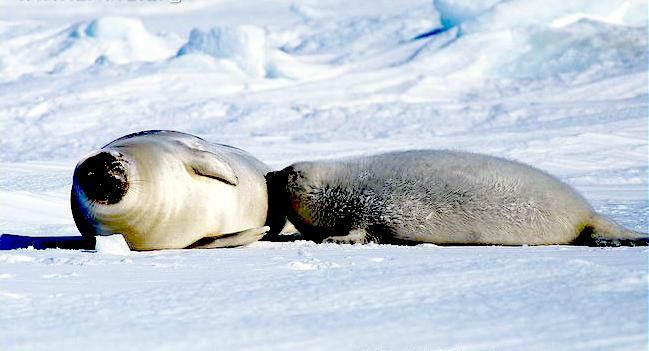 Adult males & females are similar in size measuring about 1.5-2 meters in length and weighing an average of 130 kilograms. 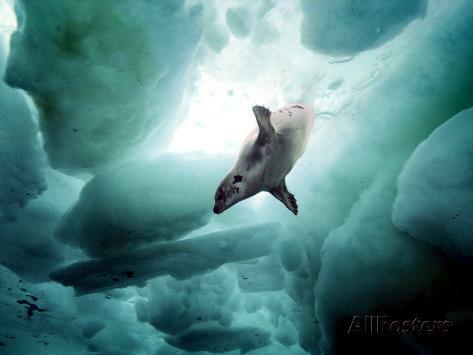 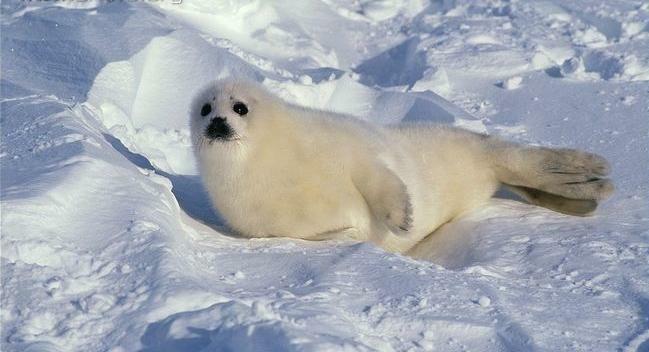 The life span for Harp Seals is about 30-35 years. 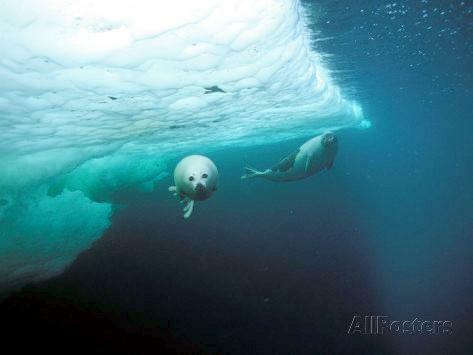 Three distinct populations of the ice-loving Harp Seal are found in the chilly waters of the Arctic & northern Atlantic oceans. 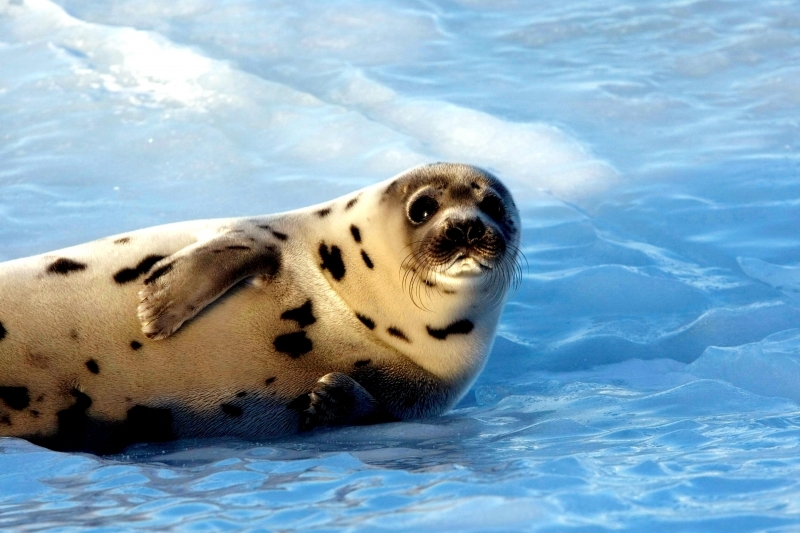 The northwest Atlantic population breeds in the Gulf of St. Lawrence and off the coasts of Labrador and Newfoundland. 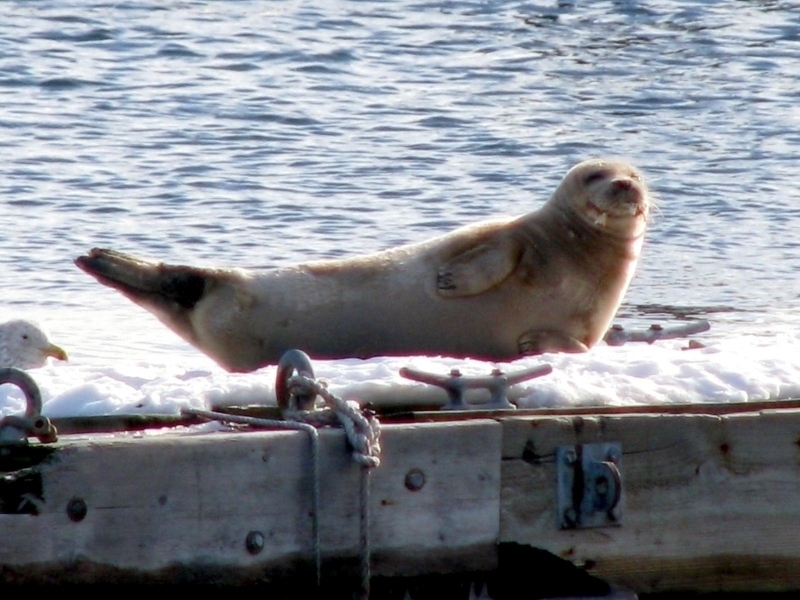 The east Greenland population breeds near Jan Mayen Island and the Barents Sea population breeds in the White Sea. 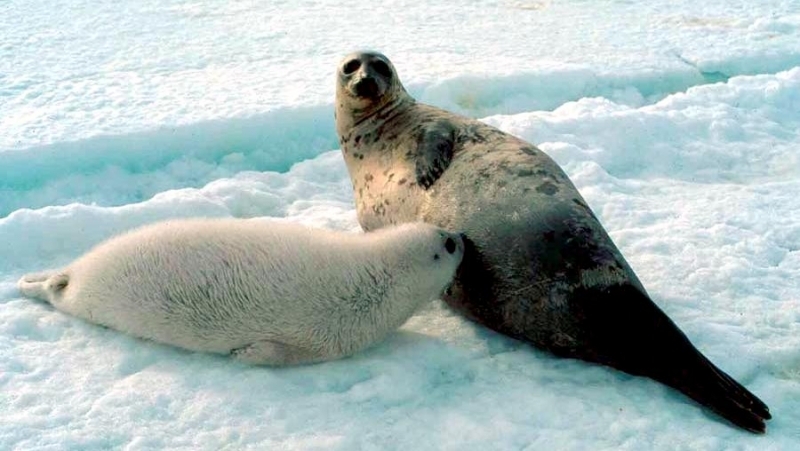 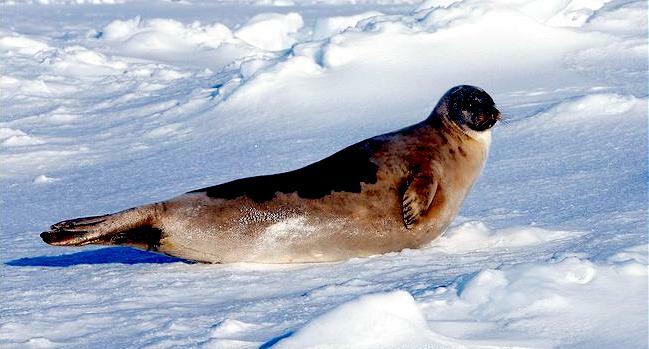 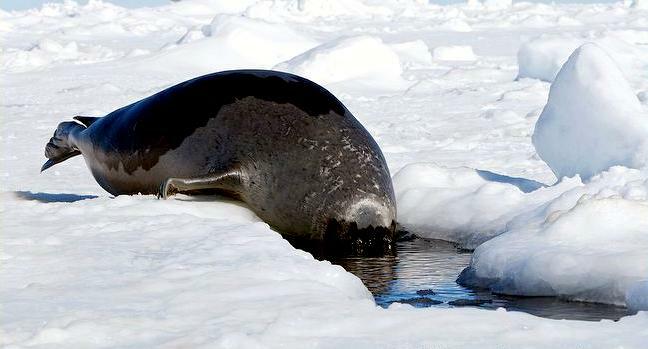 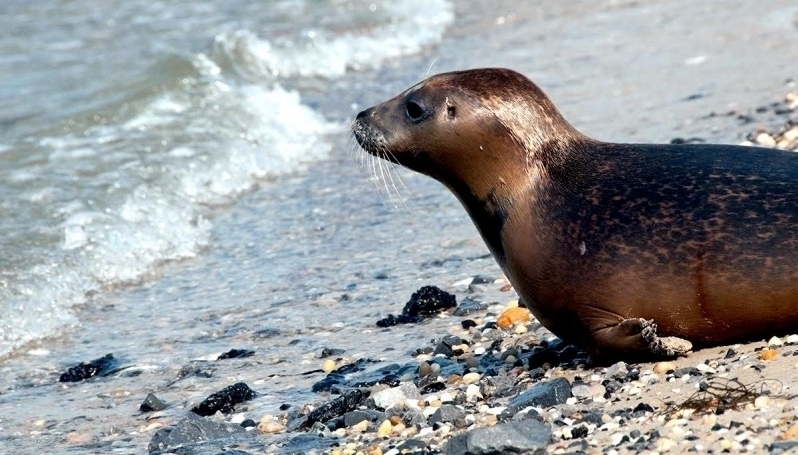 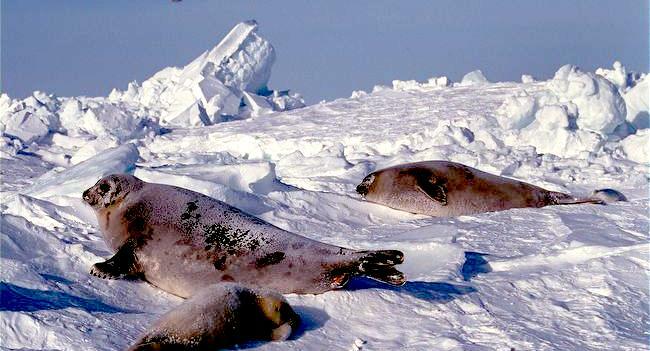 Population data for this species is scarce, however it is estimated that the northwest Atlantic population contains between 4-6.4 million seals, the east Greenland population contains about 300,000 seals and about 1.2 million live in the Barents Sea and White Sea. 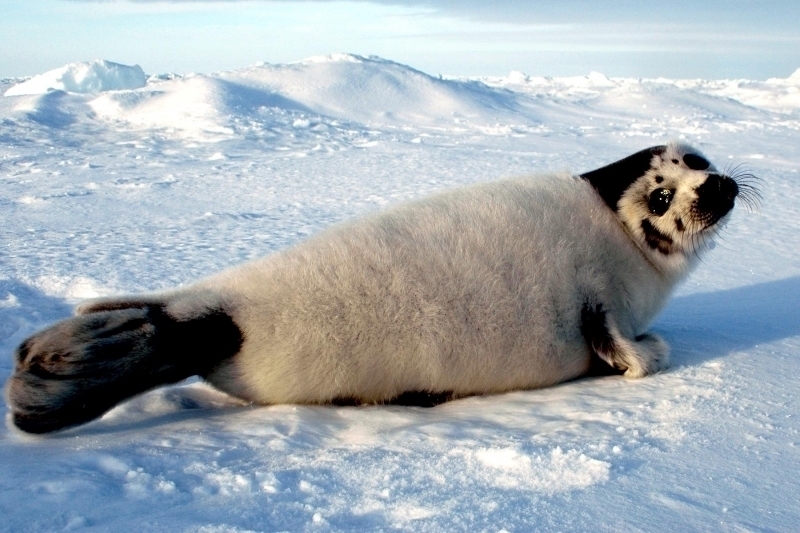 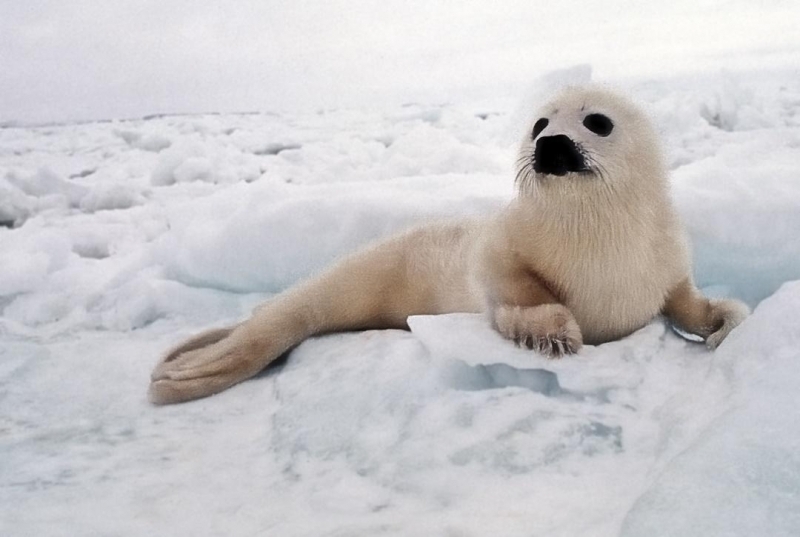 Harp Seals are a highly migratory species and have been known to travel distances up to 2,500 kilometers. 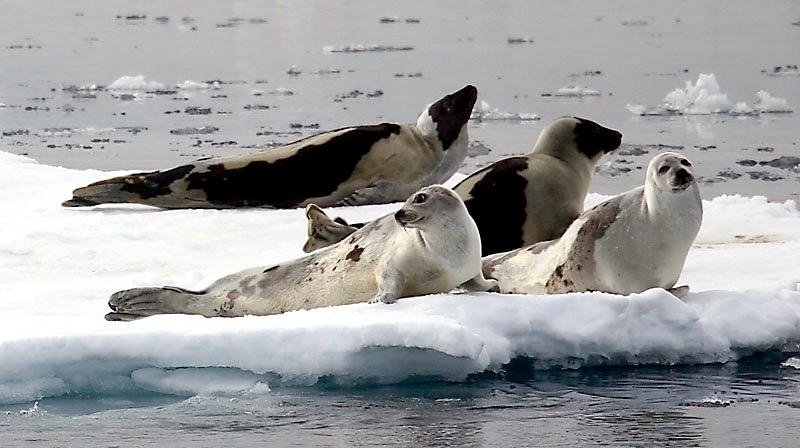 They are also a very gregarious species gathering together to molt after the breeding season, which takes place on the pack ice from February-March. 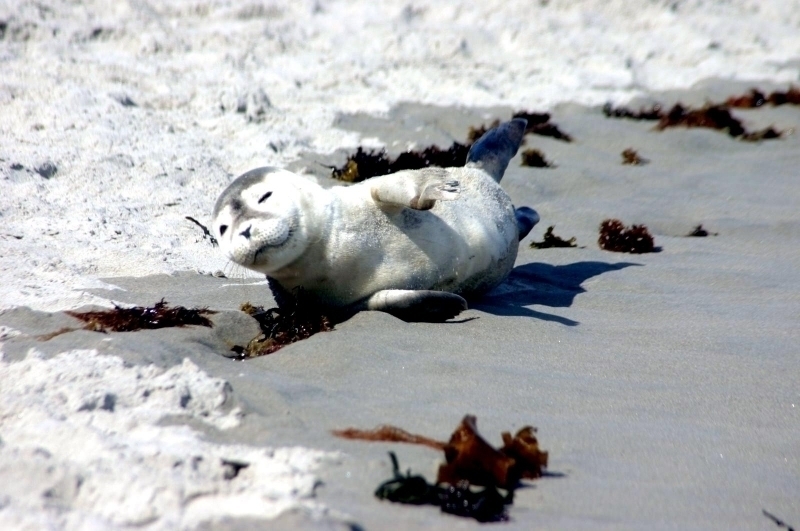 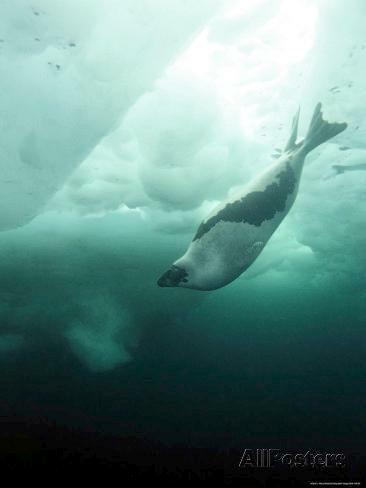 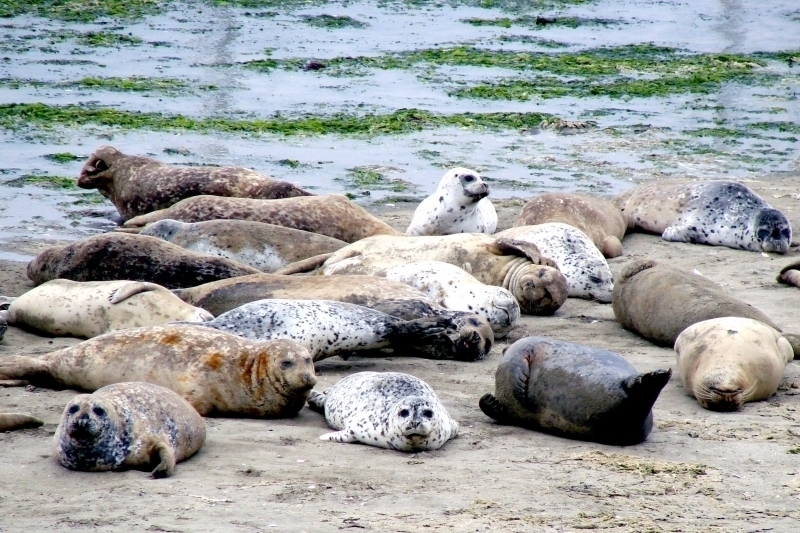 After molting, the seals disperse widely to feed during the warmer months. 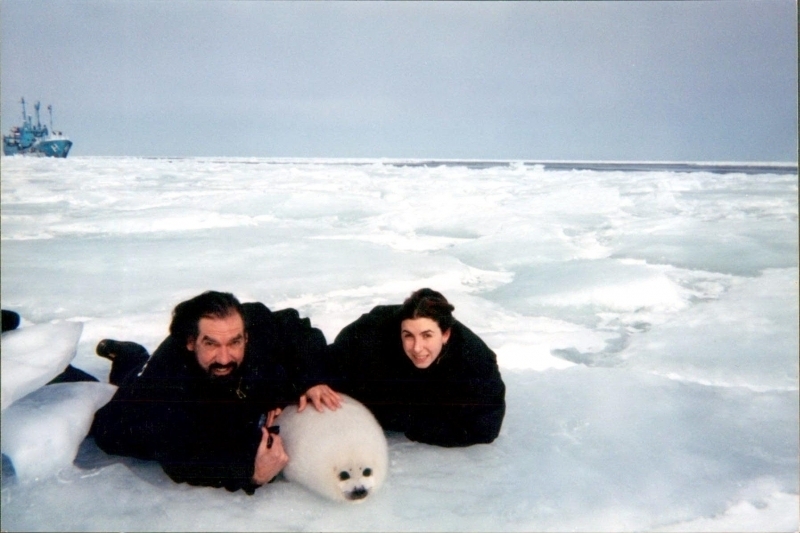 Harp Seals from the northwest Atlantic population travel to Baffin Island and southwest Greenland in early summer, then travel to Ellesmere Island in the high Arctic, some reaching as far as Hudson Bay by late summer. 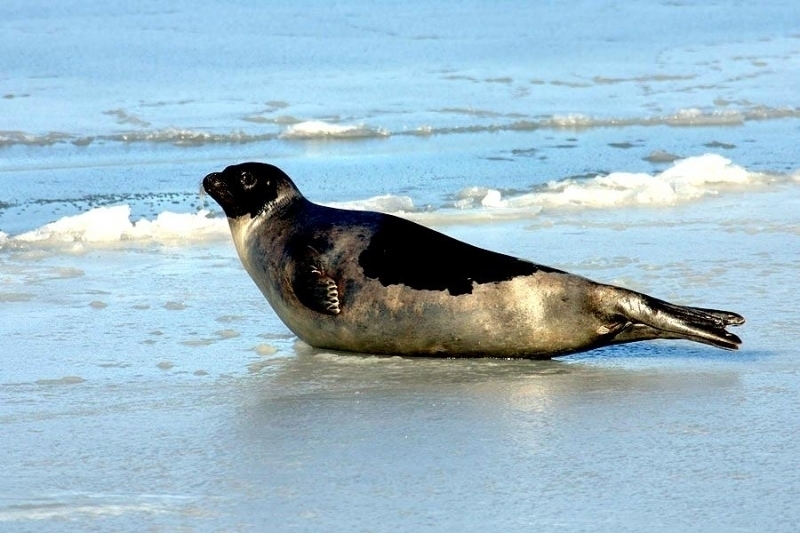 Those breeding near east Greenland have been found feeding in northern Iceland and northern Norway. 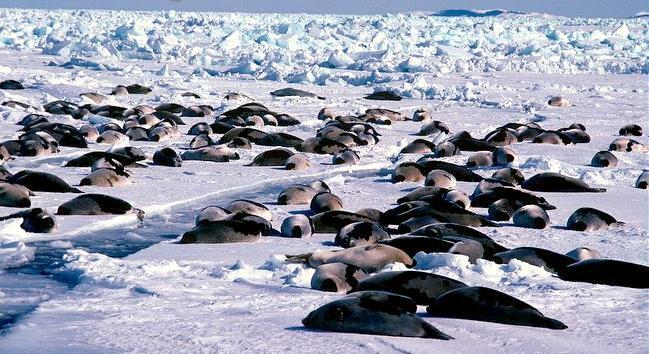 In late September, the populations begin a southward migration toward the winter breeding grounds. 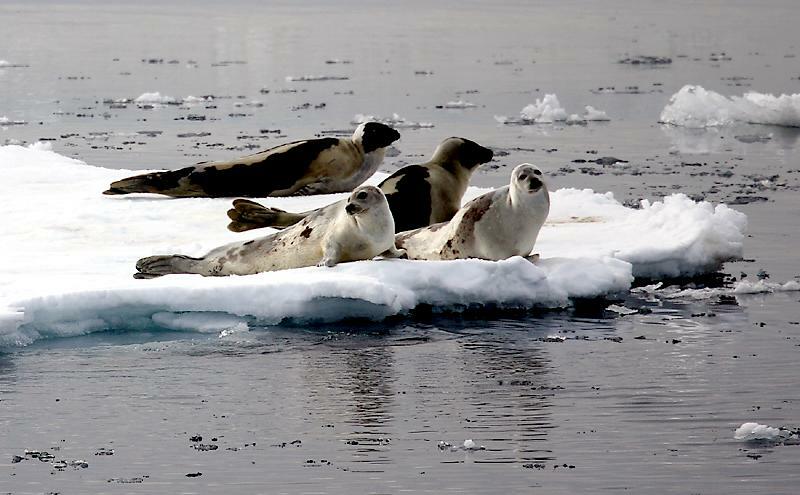 Some juveniles and non-breeding adults stay in the north year round. 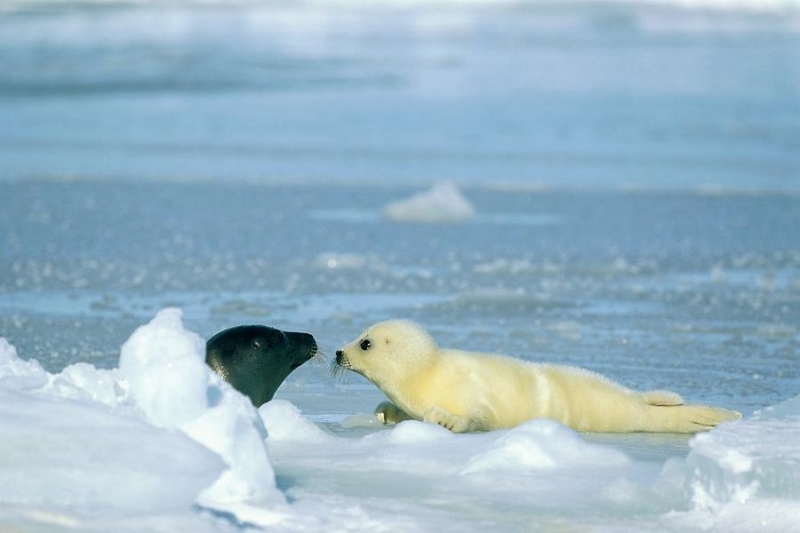 There is no evidence of interbreeding among the different populations, but studies have shown juveniles may move between them. 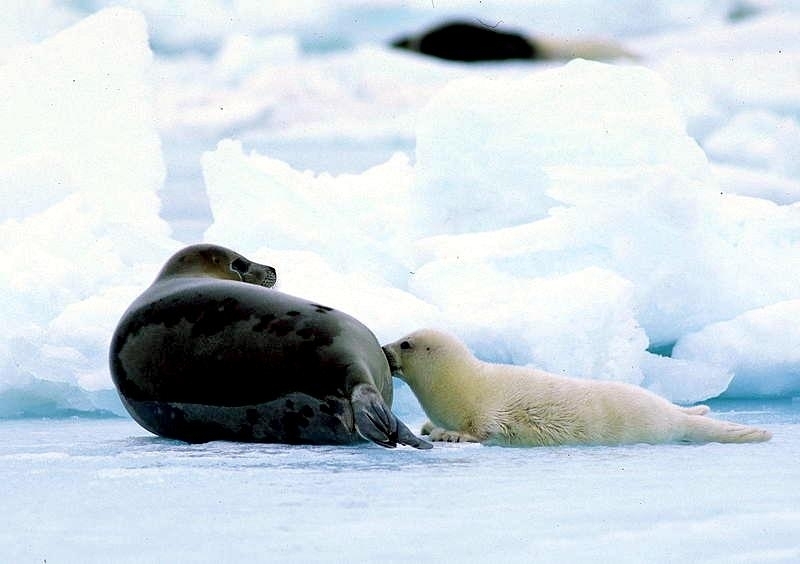 Harp Seals have a varied diet of fish such as Capelin, Arctic Cod, Herring, Sculpin, Greenland Halibut, Redfish and Plaice. 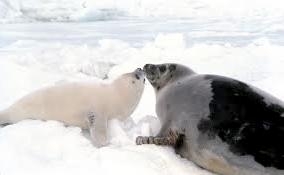 They also consume crustaceans such as amphipods, krill, shrimps and prawns. 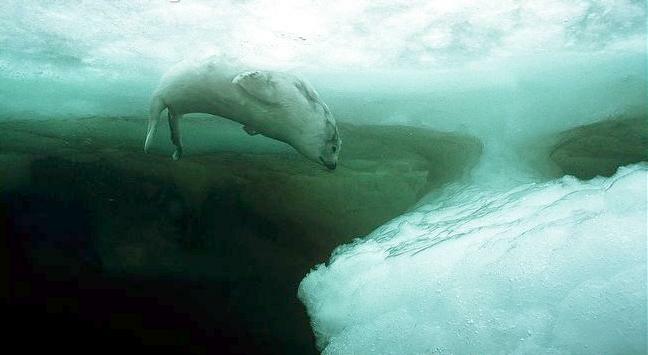 Harp Seals routinely dive to depths of 10 meters while feeding, however one individual was observed diving to a depth of 27 meters. 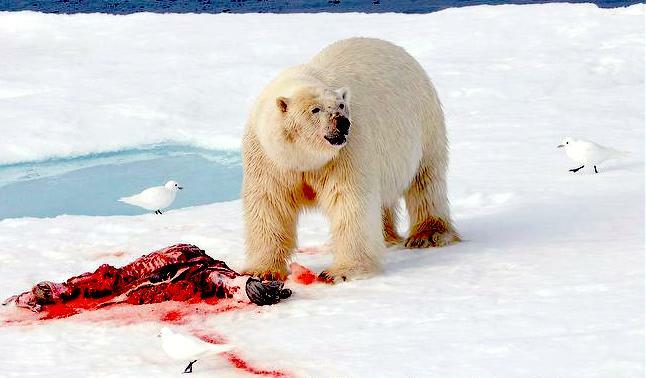 Known predators are Polar Bears, Killer Whales and sharks. 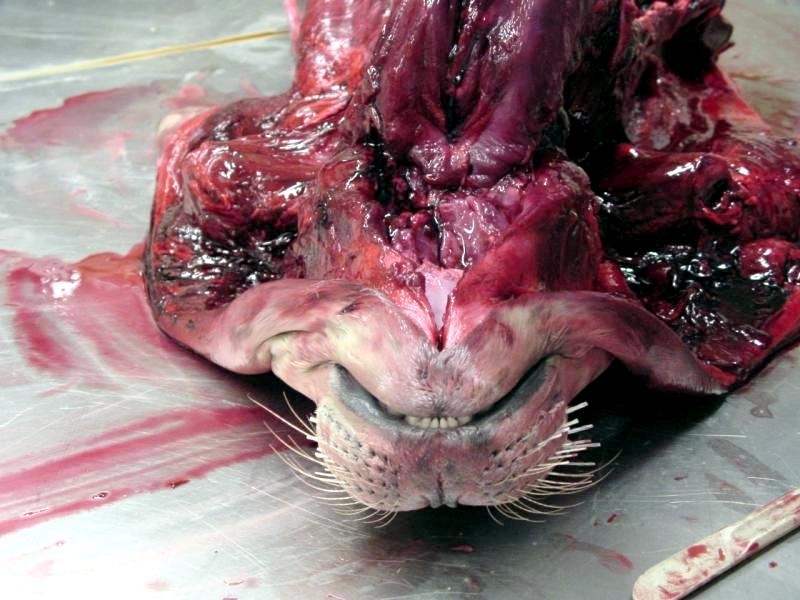 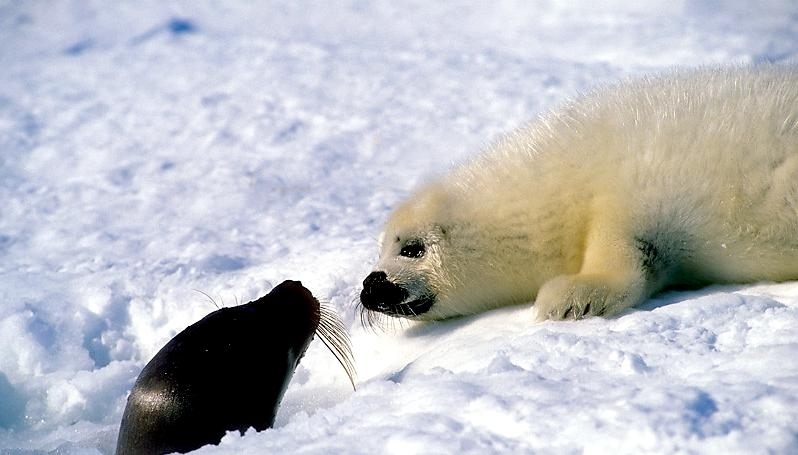 Walruses also prey on Harp Seal females and pups in the White Sea. 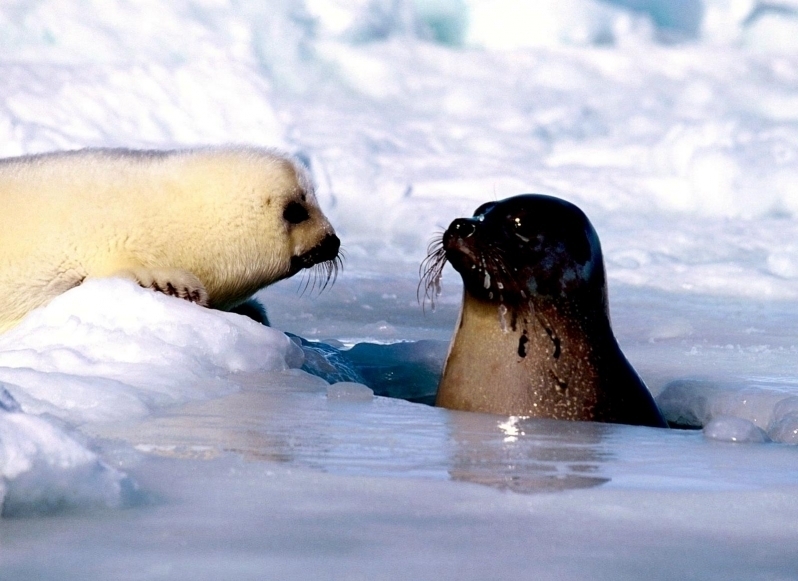 Males and females reach sexual maturity between 4-6 years. 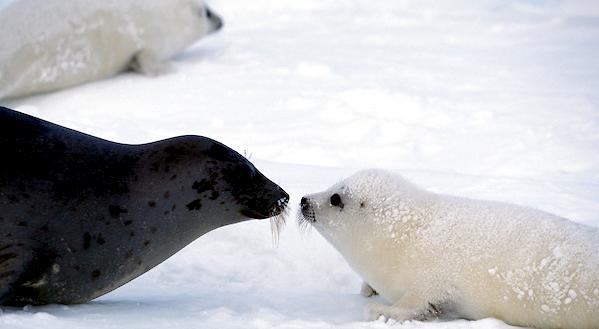 This gregarious species gather together during the breeding season to form dense breeding grounds that contain up to 2,000 Harp Seals per square kilometers. 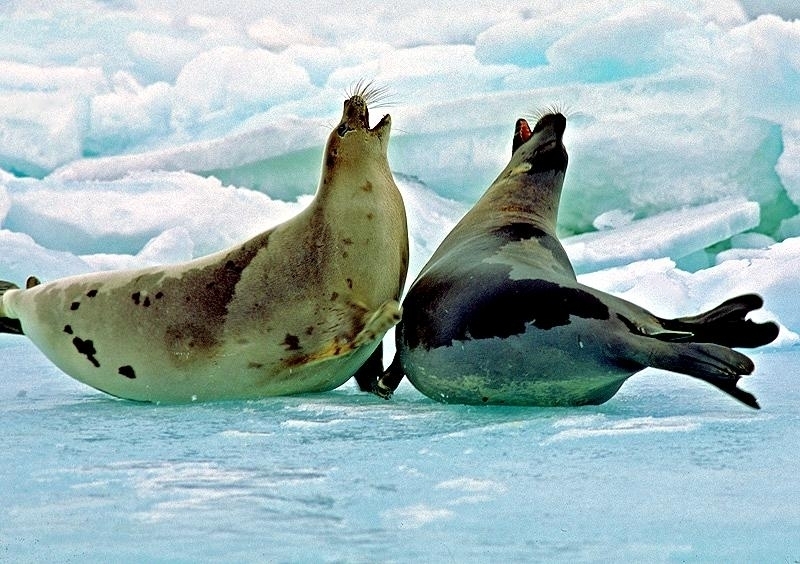 Male courting rituals include calling, blowing bubbles, making pawing gestures and chasing females on the ice. 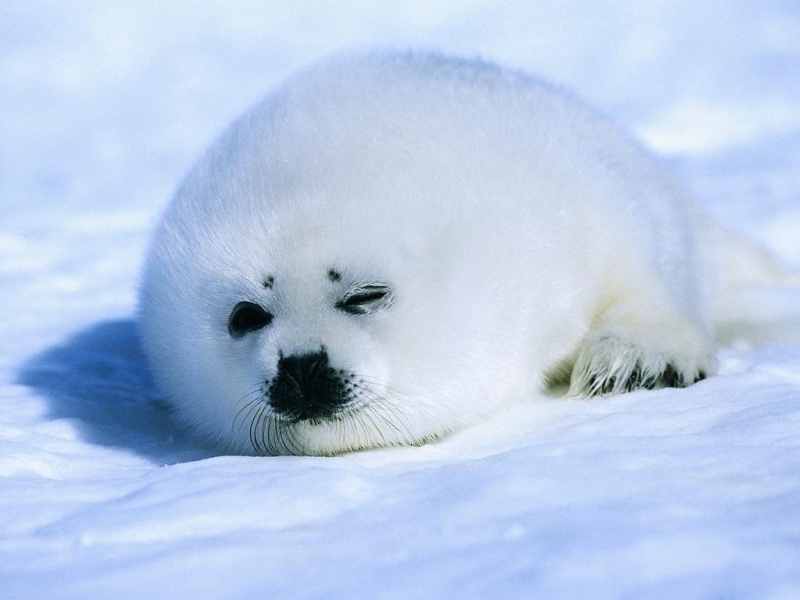 Harp Seal pups are born from late February-April, measuring 80-95 centimeters in length and weighing 10-11 kilograms. 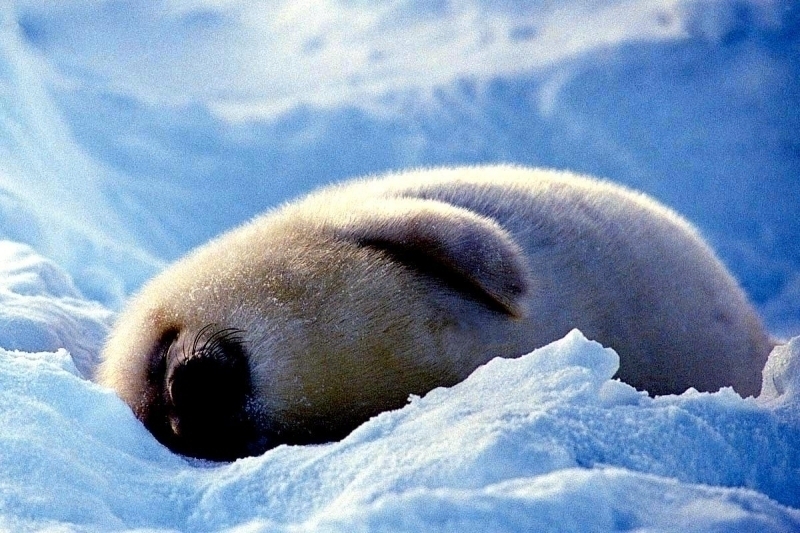 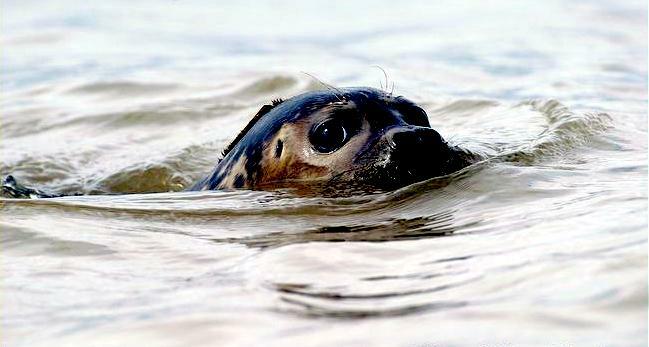 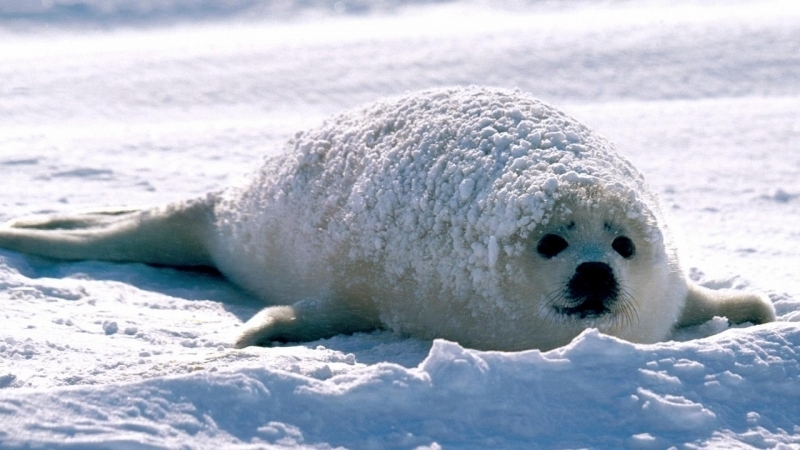 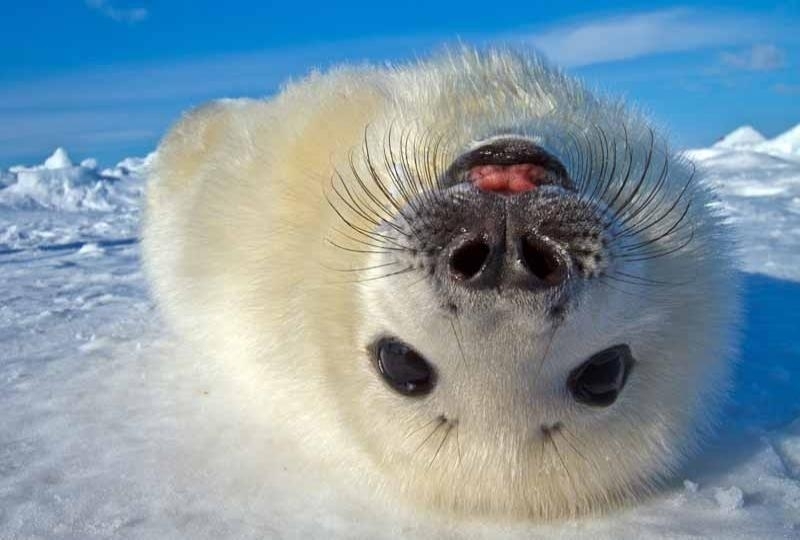 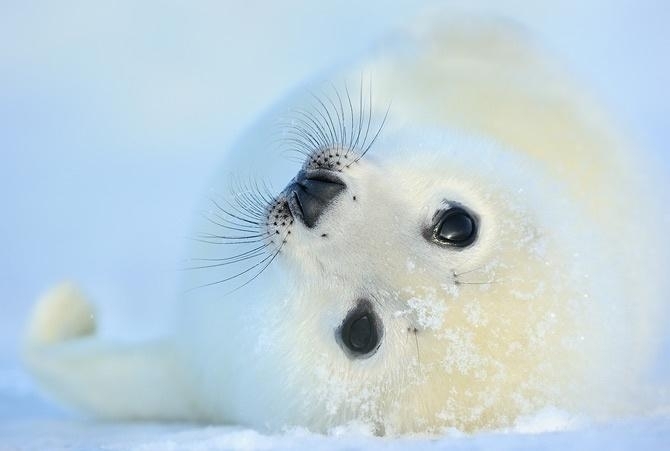 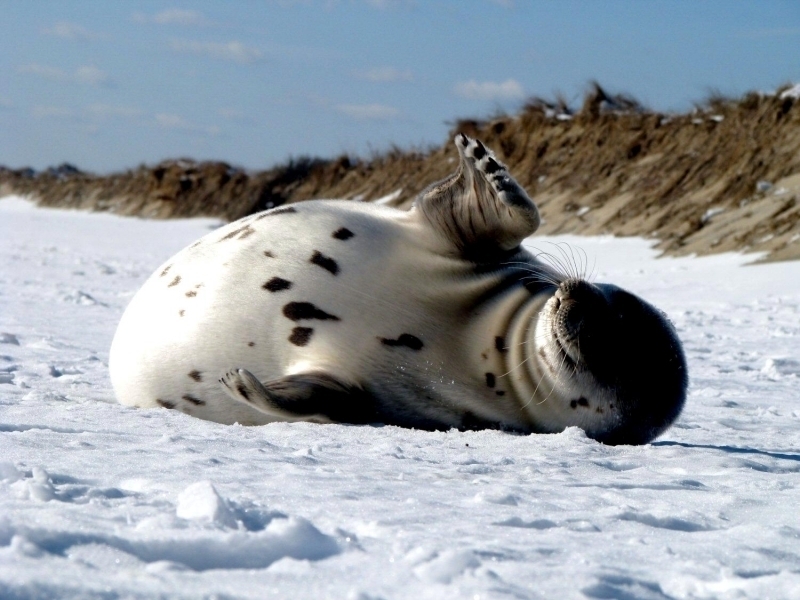 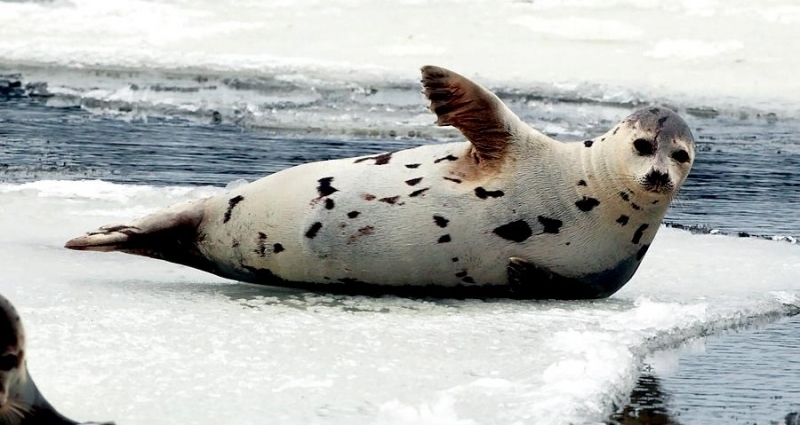 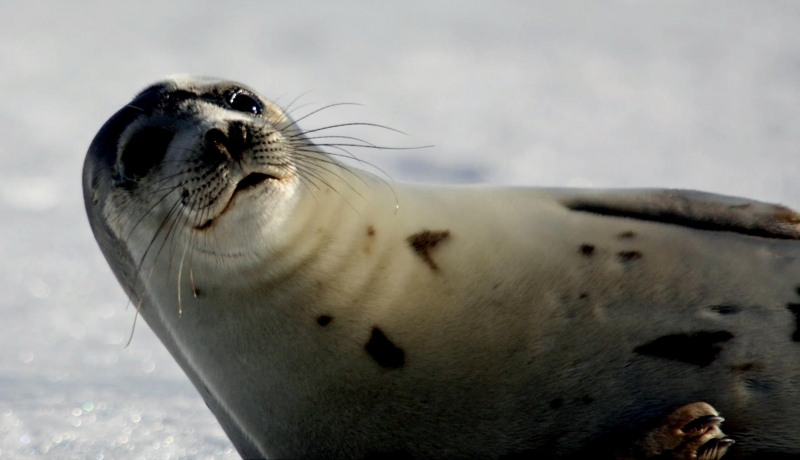 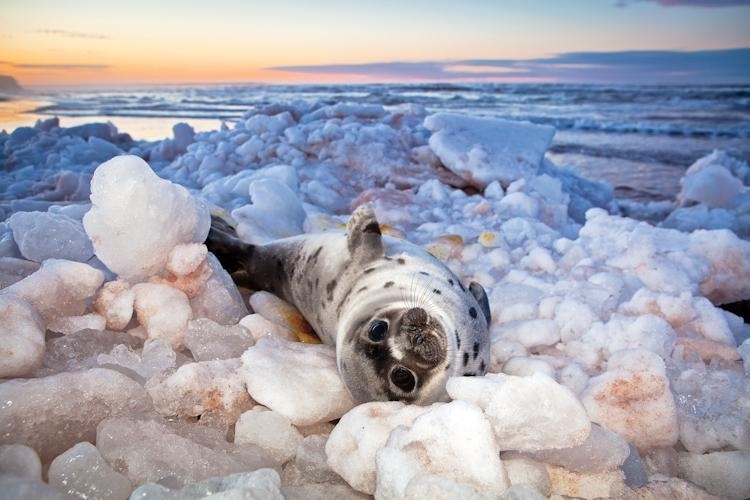 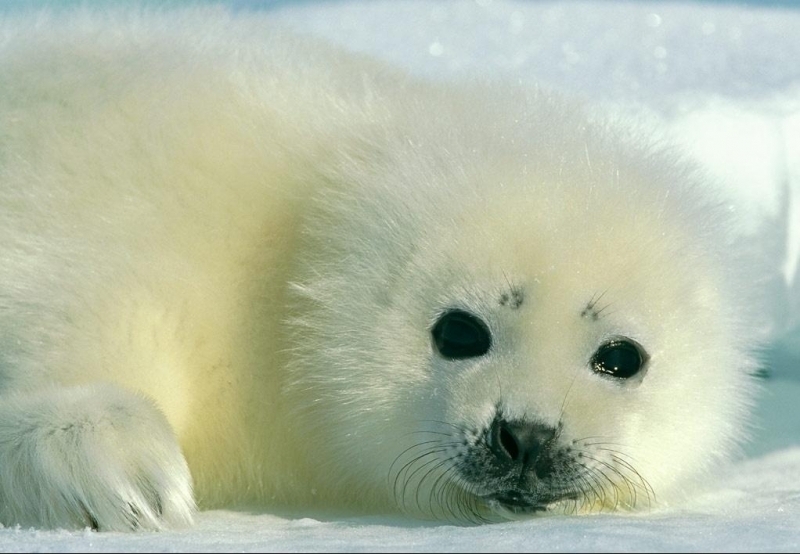 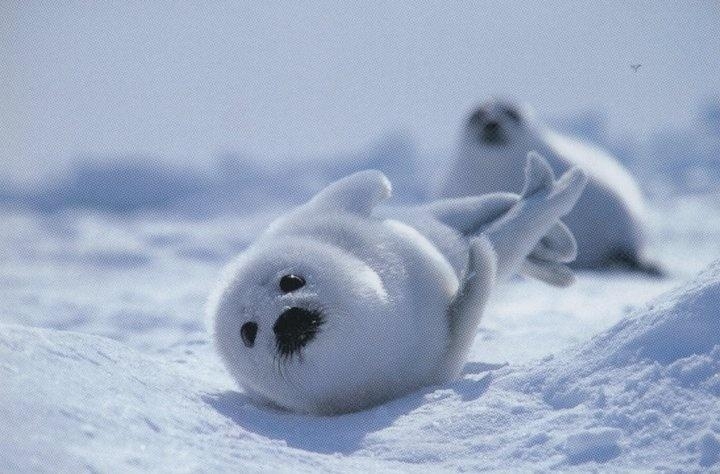 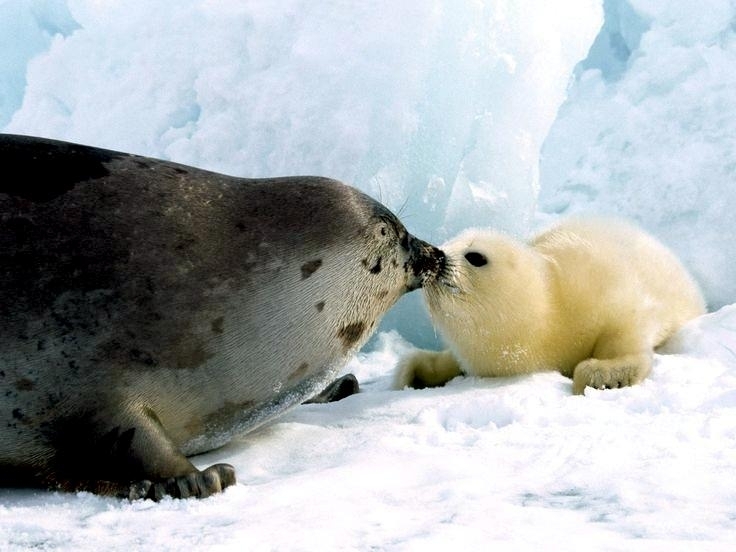 Their fur is yellow when they are born, hence the name “yellowcoats” for baby seals. 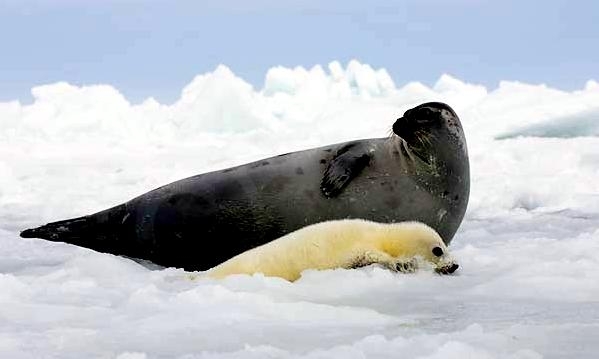 The yellow coat turns white within a few days and 2.5 weeks later, the pup begins to molt the white fur which is replaced by a silvery-gray coat with irregular dark spots. 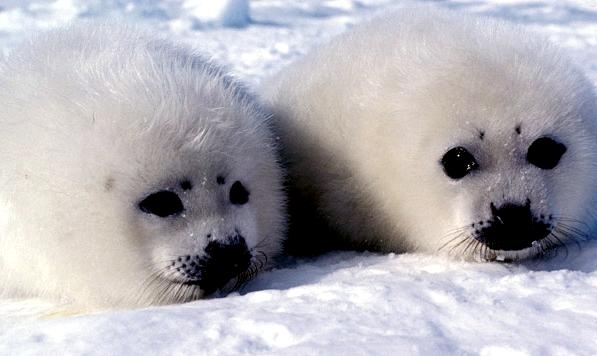 Molting pups have tufts of white fur called a “ragged-jacket”. 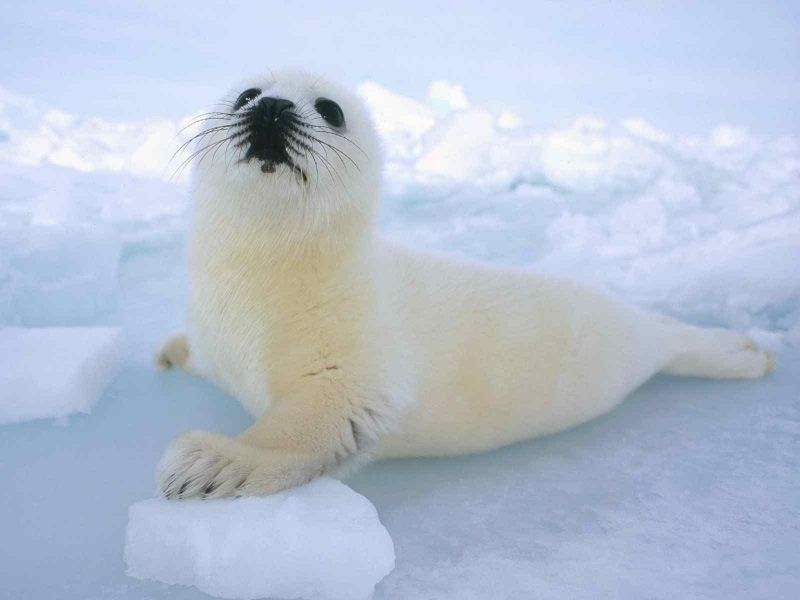 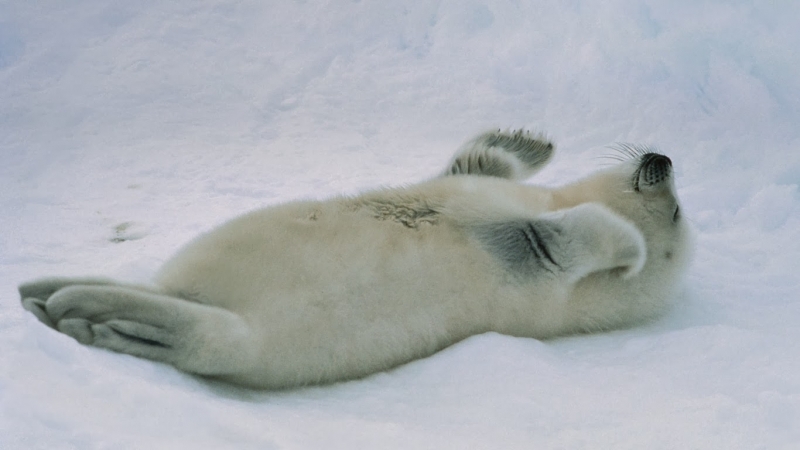 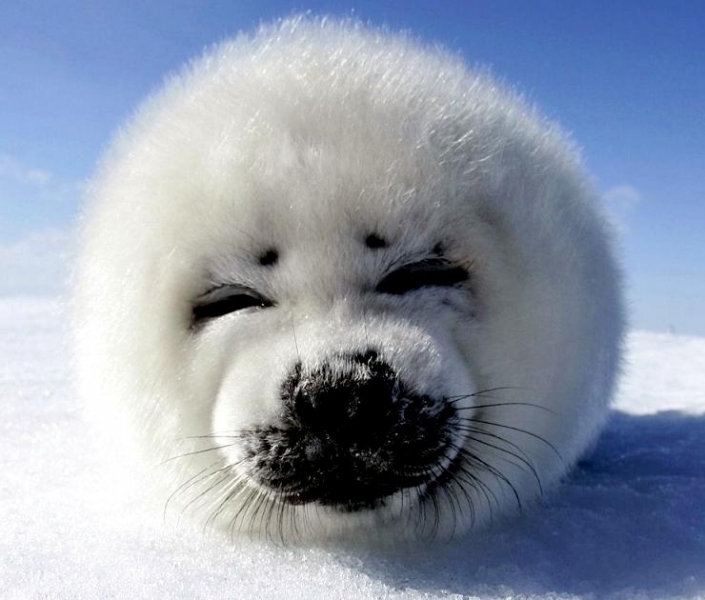 When the white fur has been completely shed at around 4 weeks of age, the Harp Seal pup is called a “beater”. 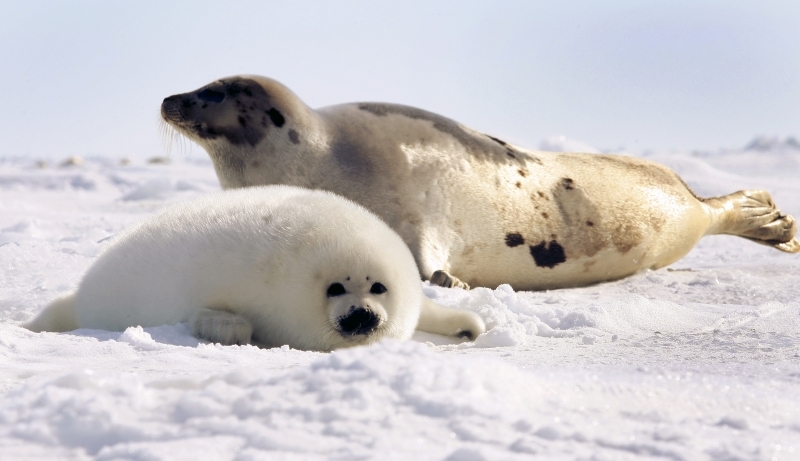 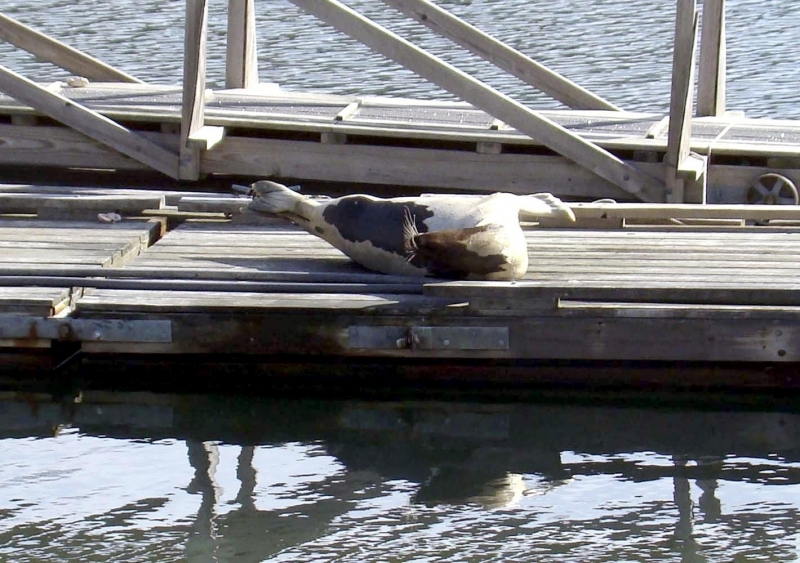 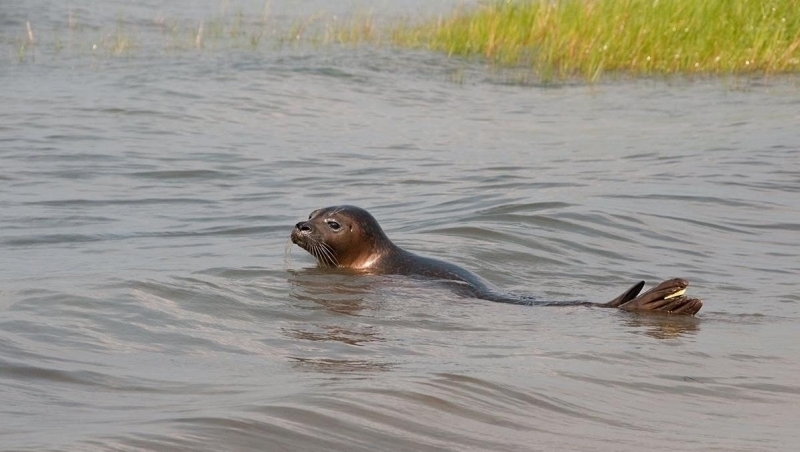 About 14 months later, juvenile coats have larger spots and the young seal is then called a “bedlamer”. 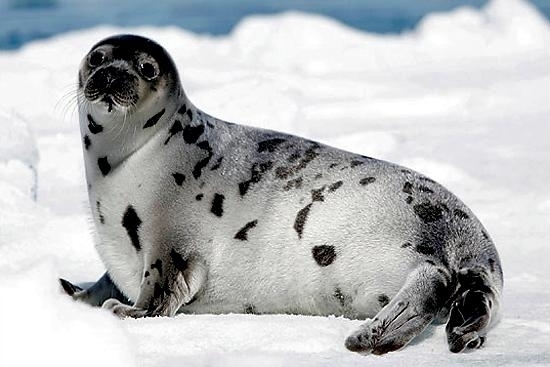 This spotted coat pattern is kept until sexual maturity when the harp pattern begins to form and in males, the head turns black in color. 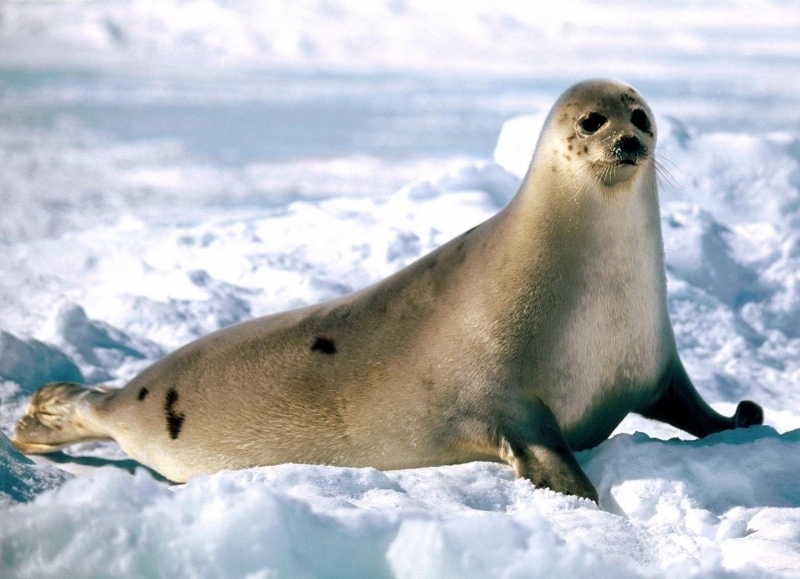 Individuals that do not develop the full harp shape are known as “spotted Harps”. 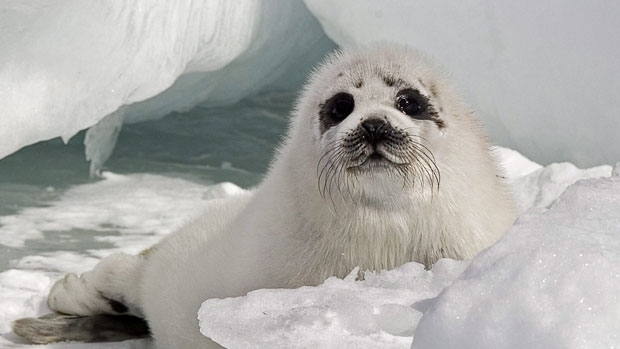 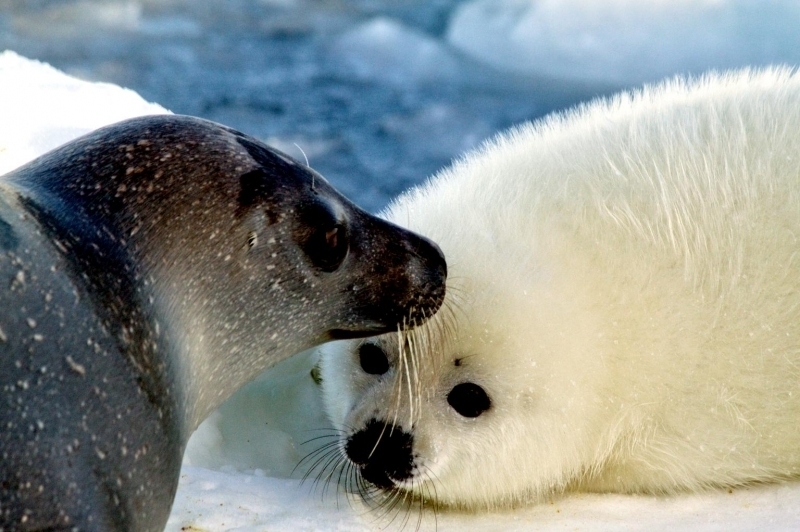 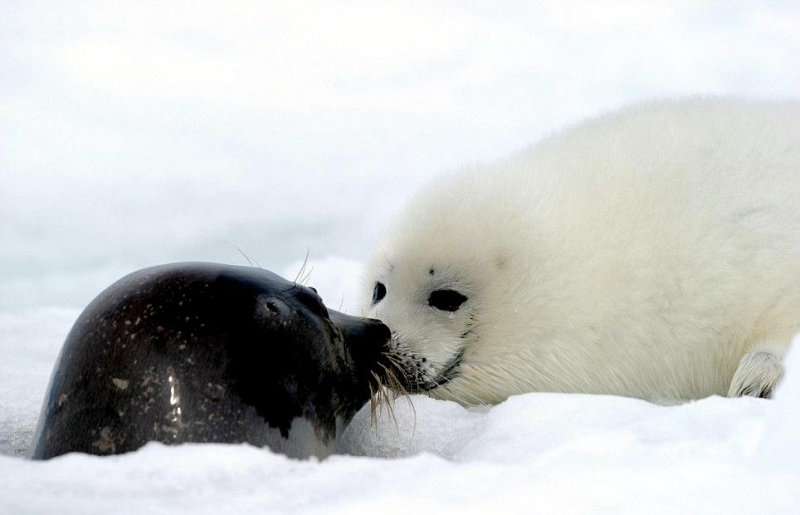 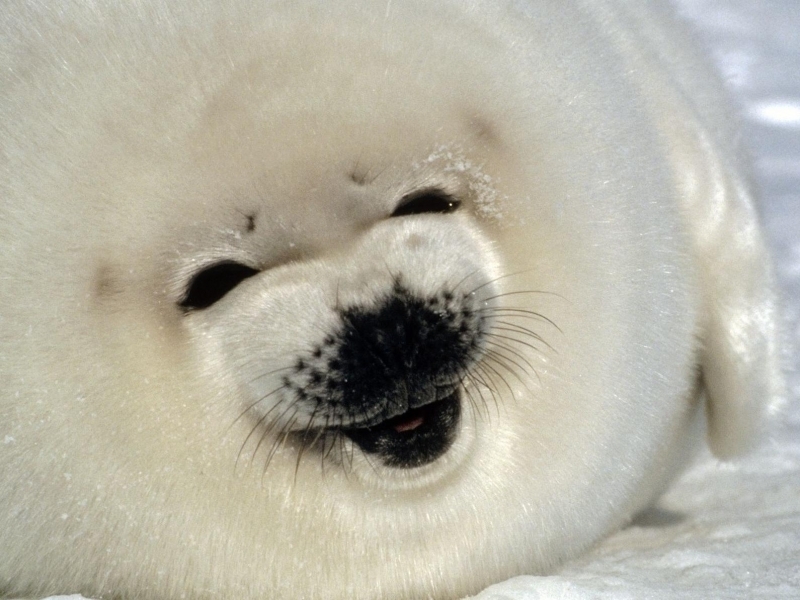 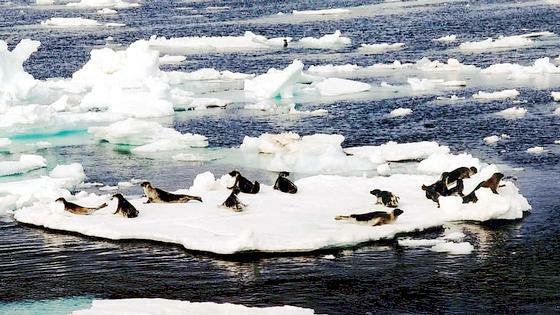 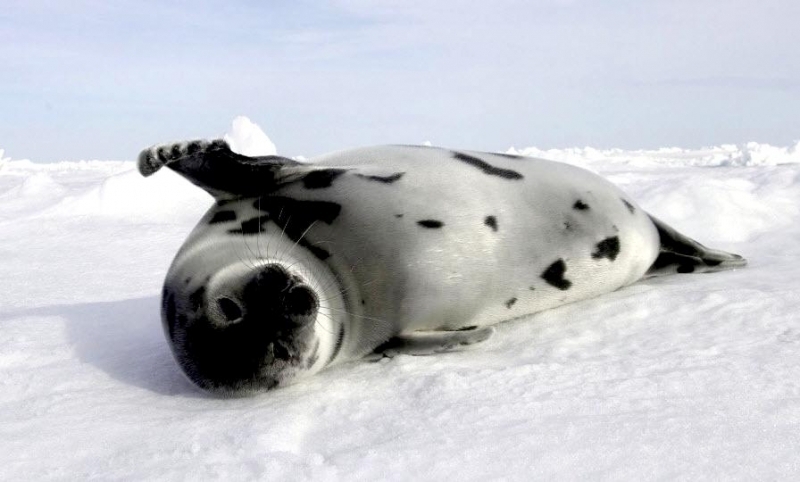 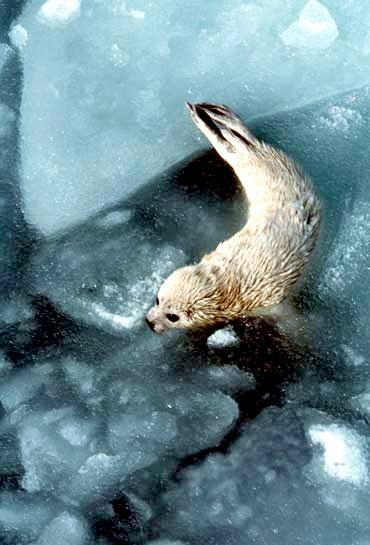 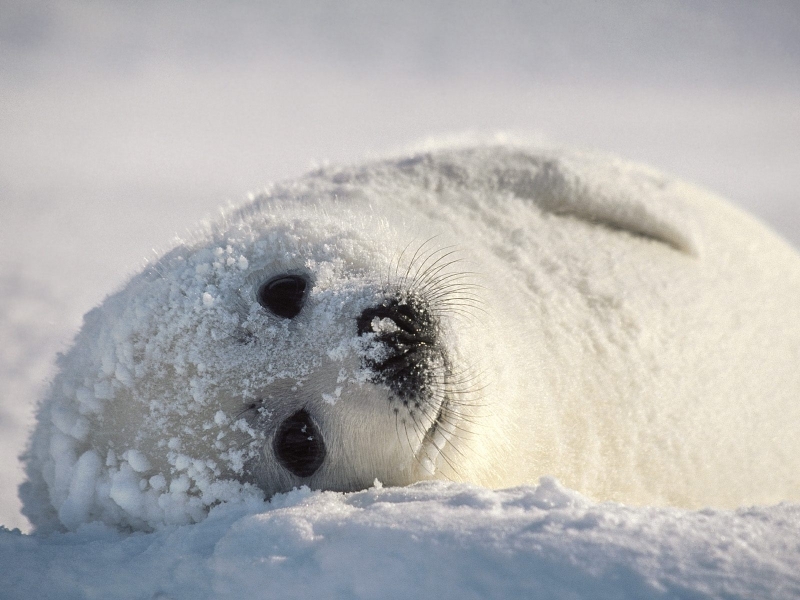 The mortality rate for Harp Seal pups in their first year is 20-30%. 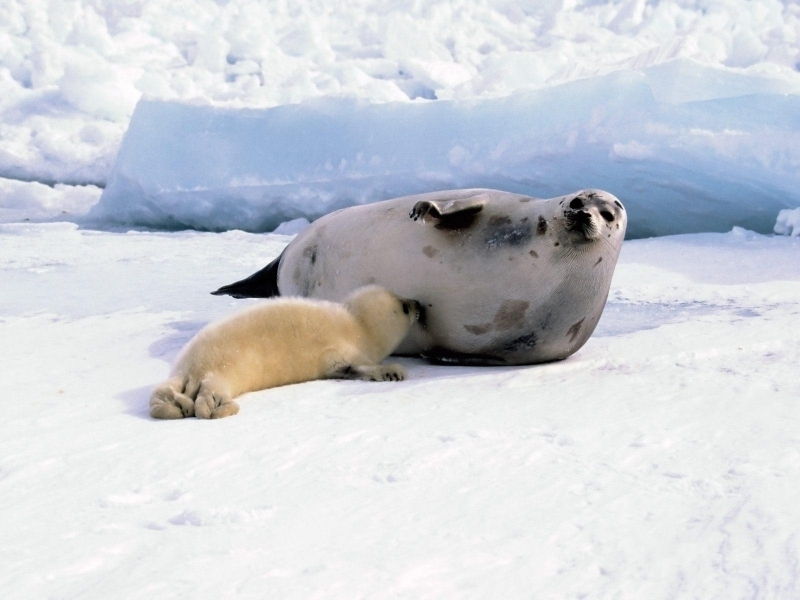 Females nurse for about 12 days during which time the pups will gain between 30-45 kilograms. 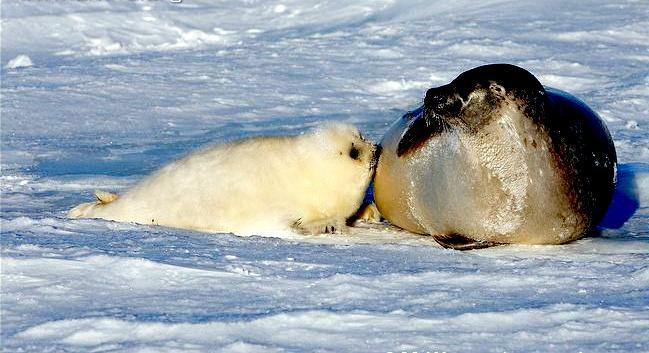 After her pup is weaned, the female mates with one or more males, usually in the water. 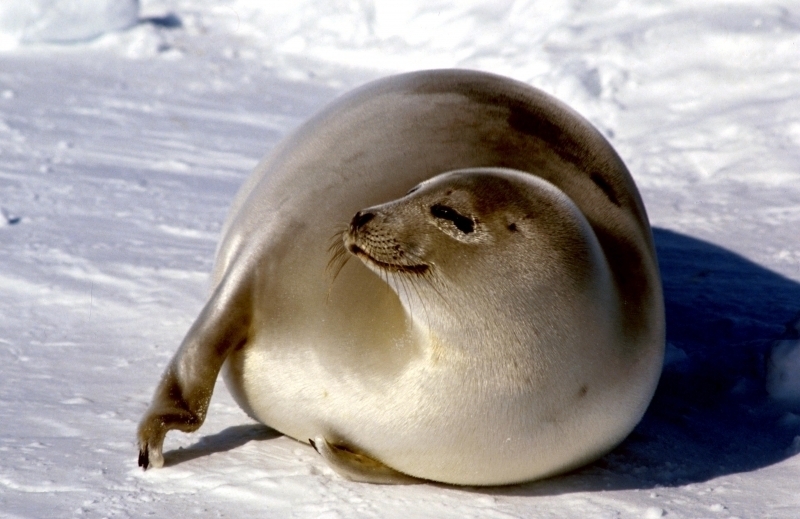 She then begins an intense feeding period before molting. 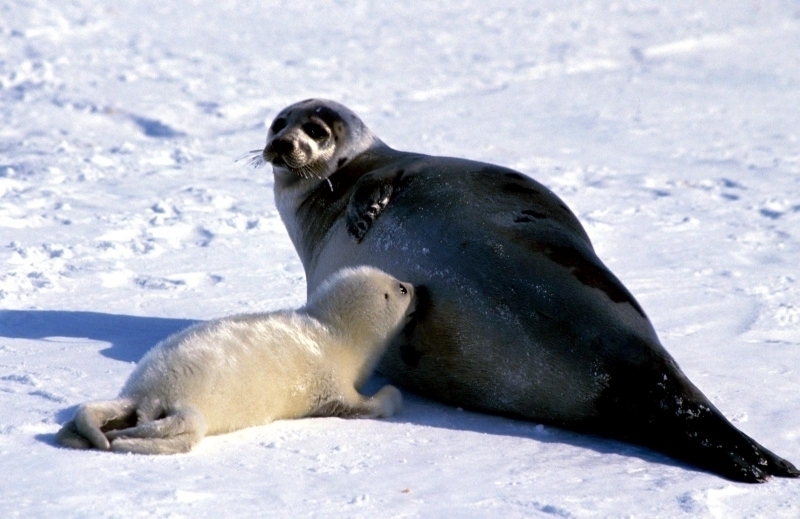 Males remain at the breeding patch as long as possible to mate before leaving to molt. 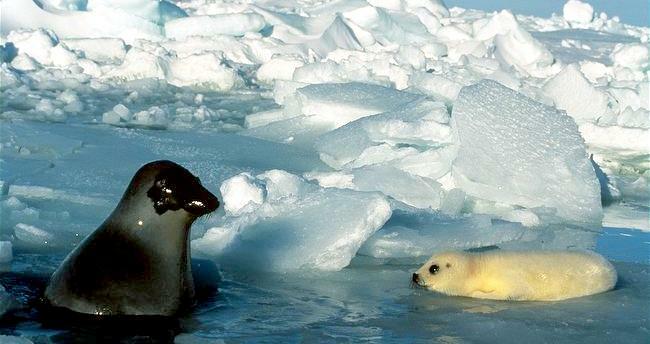 The pup starts to swim and feed itself at about 4 weeks. 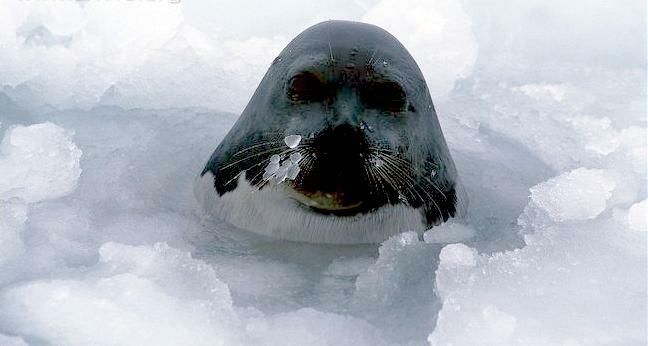 Harp Seals gather to molt from April-May eating very little during this time.